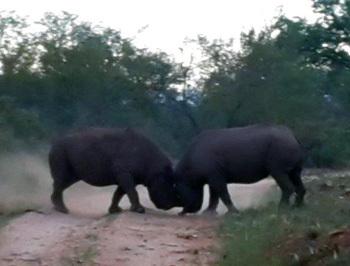 We had a group of 18 Italian tourists earlier this month who, on their Sunset Drive, witnessed a territorial fight between two Black Rhino bulls. This is an unusual and very impressive sighting. By all accounts it was very exciting with lots of snorting and vocalising. Black Rhino mark their territories by spray urinating all over the boundaries. Normally when another Black Rhino bull arrives at the boundary, he then smells the warning signs and usually does not enter another male’s territory. With the sustained drought, it may happen that Black Rhinos may disregard the boundaries and, in a quest to quench their thirst, they may trespass onto another male’s property to locate water and hence get into a fight. Territorial fight between Black Rhinos raises the dust. When I have tried to mark my territory in the home garden, my good wife, Sandra, has generally been totally unimpressed. Despite my valiant attempts to explain that not only am I letting other males know who us in charge at our home, but also that I am supplying urea to various appreciative plants and doing my national bit to dutifully save water ( we cannot flush in the garden ) in SA’s most serious drought, Sandra regards my behaviour as unacceptable. The fact that both my adult sons also mark the family territory has done nothing to improve this matter! Now to educate the grandsons………..
On a more serious note, I am pleased to advise that we did have rain in Kruger Park and that most dams are almost full. Hopefully there will be grass growth and we pray that there will be more follow-up rain! It was very hot month and raining at beginning of March. It then rained a lot in southern Kruger National Park and also a little in the central section. The dams that were empty now are full and hippos are back at Nsemani Dam. The vegetation is becoming green and beautiful. After the rains it is not easy at all to find animals, because there is water almost everywhere. We had enough rain in Balule and our almost empty dams look a lot better. Before we departed for the walk in morning everyone was happy and looking forward to it. It was still dark and quiet with only monkeys going crazy and jumping around the lodge making lots of noise. Everyone was asking what going on with monkeys this morning. I said we use them as wakeup call and everybody laughed. After few seconds the lions started roaring outside the lodge very close to the dam and I told the guests that this is the reason the monkeys are going crazy. We left the lodge immediately to try to find the lions. The big male was near Tremisana Dam and the rest of the pride was on south side of the dam. It was a beautiful sighting and enjoyable because they continued roaring during our presence – the sound was load and clear. During the bushwalk we found fresh footprints of two white rhino’s and we decided to follow them. It was interesting for guests to track animals on foot and we found them after few minutes. Everyone was happy because the rhino’s there relaxed and keep on feeding without even noticing us. On north direction we heard some elephants breaking trees. I conducted a game drive with happy guests and interested in everything and that is the reason we saw so many animals in one day. Our first sighting was two big elephant bulls before Orpen reception feeding along the road. We continued driving and along that road there was a big herd of buffalos drinking and taking a mud bath – we spent almost an hour watching them and taking pictures. After Orpen rest camp along main road there were two big male lions try to stalk impalas but the chance was very small because the area was too open. On the Sweni road we saw a leopard. The rain has finally come to the drought stricken Olifants West nature reserve. The grass is now covering areas that were becoming bare earth, bringing much needed relief to the grazers. The water has collected in pans across the reserve, giving smaller animals more accessible water sources. The sunset drives are a beautiful time of day to be driving around Olifants West. The animals of the day begin to move towards a place of safety, to hide away from the big predators. The impala and zebra are often seen together out in the open. They prefer to see the predator before it can sneak up on them, the more eyes the better. The giraffes are often spotted feeding in large groups and will continue doing so into the night, until they settle down for a short rest. The big five are never the easiest to find but Olifants West has provided me with some great sightings. This month. Buffalo seen in large herds are always great to see. The sun had set I had taken out the spot light – we turned a corner and all we could see were hundreds of eyes staring back at us. I parked the open vehicle in the middle of the herd and we just sat watching these big animals move around us, feeding on the new shoots of green grass. A great sighting and so close to the vehicle. The elephants have been very good recently, with them often moving around in the early evening. My guests and I came across a beautiful sighting of a matriarch and some young calves, feeding on a pushed down tree. We could see the little calves trying to copy the matriarch pull off the leaves, but would only manage to pull off a few and the rest would fall to the floor. The lion sightings have been good, especially with regard to the Olifants West pride, which we see most regularly. My guests and I got very lucky the other night, just after leaving the lodge we managed to bump into the whole pride. They had spread themselves out next to the road, all ten of them. We could get beautiful pictures as they just lay around looking up at us, a great start to the drive. The King surveys the landscape. My best sighting was however a late night sighting of two big white rhinos – at first we could only hear crunching noises in the bush, followed by snorting sounds. I looked around with the spot light hoping to catch a glimpse of these big animals. We could only see the one; the other had positioned himself behind a large bush, a great sighting none the less. On a day drive in Kruger, the weather was cool, cold and drizzling. Sightings very outstanding. Lion’s sightings three times. White rhinos seen twice on different occasions. Big herd of buffaloes amounting to 600 +. Leopard walking 30m adjacent to the road on the H1 near Orpen. Many elephant bulls also seen as we exited the park. Outstanding leopard sighting towards the exit of the H1 Rd on the Orpen gate. The leopard stood on one of the branches like a display. Later the animal decided to alight down and walk along the road. Guests were so excited! At the Balule Nature Reserve a cheetah was seen by the Rome 1 junction after the morning walk activity. Elephants became a bit scarce – the reason : an elephant bull died.. Looks like many elephants walk there to mourn. Very rare to see them at the Olifants river. The morning walks along the Olifants river become so exciting as hippos can be seen at a very close range. After we have received the fair amount of rain during the month of March we can see hippopotamus congregating in family units at the river. Civet, genet and other small animals was seen along the Olifants road during the sunset drives. The big pride of lions at Xigamba dam is amazing after the lions had killed an animal. The pride looked so tired resting under the weeping wattle tree with blood marks on their mouths. On a lovely bush walk, Murray and I were with guests that were fascinated to just walk in the big five area with a ranger as I pointed smaller things to the guests. Small creatures including velvet mites, millipedes and golden orb spiders including the pair of tawny eagles on a Knobthorn tree. 2/3: Sundowner drive herd of elephants Olifants River. 2 bull buffalo, 2 black rhino on Marula Road and pride of 9 lions on Marula Road. 3/3: Bushwalk 1 bull elephant Rome I. Sunset drive 3 bull elephants Rome I, 2 bull buffalo at Spruit feeding. 8/3: Bushwalk 3 white rhino Rome I. 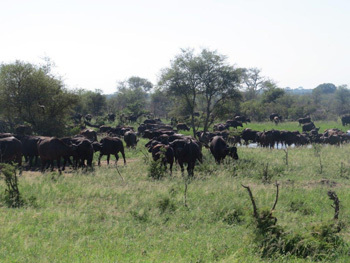 12/3: Sundowner drive herd of elephants Marula Road plus 2 bull buffalo Olifants River. 13/3: Back from bushwalk pride of 10 lions Olifants Road Cambridge 3. Sunset drive one big bull elephant Olifants Riviera ns small herd of elephants Rome I. 16/3: Before bushwalk pride of 10 lions Olifants. Sunset drive herd of buffalo Marula Road and one black rhino female Rome I. 2 bull buffalo at Olifants Rivier. 19/3: Sunset drive 1 female black rhino with calf on Campfire. Sundown drive 2 elephants bulls at Spruit and pride of 10 lions Olifants Road Campfire. 28/3: Bushwalk herd of buffalo Rome I.
Ok! So wow this month has been really exciting for me with all the amazing sightings!!! So let me start with the best first of course!! So this month has been truly amazing in the Kruger Park. The best sightings were of rare animals like the highly endangered African Wild Dog and rarely seen cheetah, leopards and many more amazing sightings. 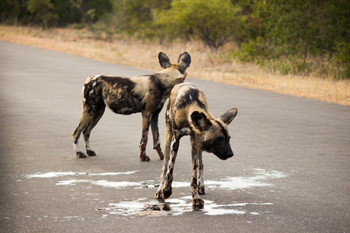 The Wild Dogs being the most endangered species in Africa have been making a lot of awesome appearances within the Kruger. I saw the dogs at least 8 times this month compared to an average two sightings a month. On one occasion I heard of a sighting of dogs on the move a few km away and so I didn’t expect them to be there still so I took a slow drive viewing other animals at the same time. All the odds of seeing them were against me cause of several reasons but after about an hour the sun came out and the dogs were lying right next to the road under some trees. We were alone for at least 10 minutes and got to watch them digging, playing and acting quite hilariously. On several more occasions I managed to find the dogs by myself near areas where I had spotted them before. I now know of at least 4 different packs within the area where we drive in the park. Many times we got the dogs right at the end of the day near the Orpen gate. Then on several occasions I even managed to find the rare and elusive cheetah. On my birthday we were blessed enough to get to see a mother cheetah with her 3 cubs who had just made a kill not far from the road and then later that day I got to see another male cheetah on the way out of the park. On another more recent hot day of about 40 degrees I managed to find a couple of cheetah together sleeping under a tree. In the distance resting. Of course there were many other cars waiting to get a turn to see these rare animals. 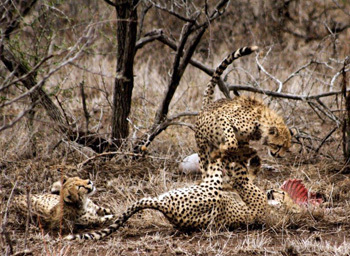 This was just 3 of quite a few cheetah sightings this month. Cheetahs resting under a tree near the road. This month the leopards have been a bit quiet, however that didn’t stop me from finding at least 3 a week. On one of the drives in Kruger I hadn’t heard of any leopards at all that were nearby and so I thought to do the only logical thing!!!! Take a really long road that I knew very well and look for one there where I have previously spotted many before. Eventually I managed to get one of my favourite young males right next to the road and we were alone with it for at least 15 minutes. On another awesome leopard sighting I managed to find a really old male which I had never seen before. His eyes were almost blue and you could see he had quite a long tough life. But the awesome part was to see him snarling at us slightly, just warning us to stay put as he was detecting a bit too much movement within the car. Leopards are unfortunately very elusive and don’t like too much company. On many more of the sightings the leopards were quite scarce and shy but the guests were pleased to at least have the honour of experiencing this beautiful creature. So as for the lions!! Well needless to say : Kruger certainly has no shortage thereof. On many occasions I managed to find multiple lion sightings in one day – many of them right next to the road watching us and looking curiously as we watched them. On many of the lion sightings we were blessed enough to see them with kills that they had made recently and it is also quite an authentic experience when you can smell the carcass close -being so close to them is quite a treat. These are just a few of many more sightings this month of some of the rare and awesome animals. We also so many countless sightings of rhino, elephant, buffalo, the rare sable antelope, hippo any many more within the awesome Kruger Park. Well…After my first month here at Viva Safaris I am settled in and have learnt the ropes or should I say roads. It has been a rather successful month all round but especially good with sightings of all the general game, Big 5 and some of the rarer animals and birds. The sightings on the drives have been lovely despite the hot weather lately but that is expected for summer in the Lowveld. The highlight sighting of my first drive here was a Cheetah lying under a tree near one of the dams on the concession. Just a few days later at the same dam on afternoon drive there was a pride of lions fresh off a kill. Throughout the rest of the month there was three more lion sightings where they were lying just on the side of the Olifants Road, all of which were the Olifants West pride of 10 lions. There were also several Elephant sightings with one drive getting four different sightings. Hippos were seen on most drives down to the river until we got about a week of heavy rain which made the river flow too fast for them but they are back and ready for more photographs. Went with James on two occasions this month to Kruger. The one day we managed to get three different lion sightings and one amazing leopard sighting. 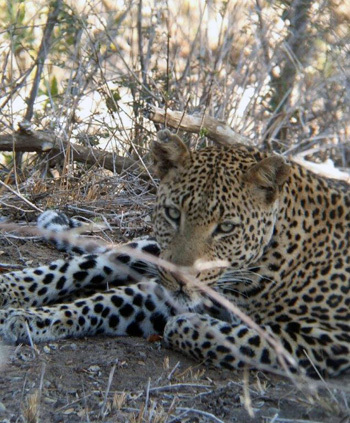 The leopard was just lying about two metres from the side of road near a dry river bed relaxing so we had plenty time to view him and take the whole setting in. We also saw a small herd of Sable antelope on the way back to the gate at the end of the day. There was a lot of activity around Marula Boma this month with the usual Hyena and Civet there most nights but quite often we had the elephants visiting and pushing over the trees around us. We also had two bull White Rhinos fighting about 20 metres away from the boma. There is just one word for the last few days on bushwalk! Insane!!! Rex and I have been very lucky the last few days… We got to see lions, buffalo, elephants and rhinos the last few days on the walks!!! With the lions we first heard them then we went in to see where they were so we saw them for a short while before they ran away from us. Moving in closer we discovered that they were busy eating a baby zebra – which was very interesting but scary at the same time!! 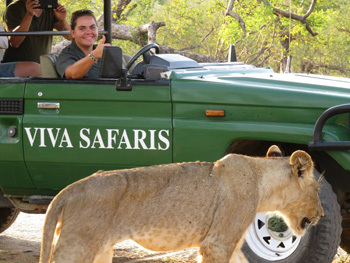 The guests were absolutely thrilled and were so glad they had booked with Viva Safaris! On my last morning drive we got very lucky getting Zulu the Black rhino who decided to charge my Landcruiser instead of just running away – guests were again praising Viva ! Tanya and guests close-up to lioness. One day we got very lucky!!! We were driving and all of the sudden there was a cheetah next to the road with an impala kill. We were very lucky to spend a long time alone with the young female before the other cars started moving in! 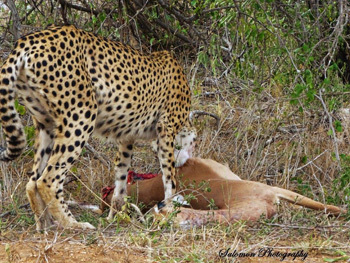 Exceptional sighting of cheetah with impala kill. After the rains the elephants are back and making sure we know they are. At Marula Boma where we eat our Bush Braai we were very lucky to get elephants almost every night coming very close to us and making it an unforgettable night. On the 1st of March I went to Kruger for a full day drive. The day was too hot about 36 to 38 degrees. Sightings were difficult but we tried our best. Elephants at the first view point at Orpen Road, rhino before Rabelais T-Junction crossing the road, Lions at S100 before Shibotswana waterpan, leopard at Sweni Bridge lying down at the Sausage tree on the left side of the bridge. Buffalos at Muzandzeni picnic areas. On the way back a pack of Wild Dogs near Rabelais. On the 4th leopard lying down in the first stream before reception, buffalos in an open area before reception, elephants at Nghala tented camp T-Junction. Rhino near Tamboti , lions kill a buffalo at Satara road before S 127 junction, a beautiful secretary bird at Sweni pan windmill, Sweni 3 white rhino’s lying down. On the 13th Kruger, Elephant at Orpen water pan drinking, white rhino near Kingfisher Junction grazing on the left side, lions at S100, at 4km after the hippo’s pool, more elephants at S100, more buffalos at Muzandzeni picnic area, elephants there also, giraffe and zebras at the pan also. On the 15th leopard at 4km from the first gate before reception, white rhino and elephants in an open area. Wild dogs at Rubelais road lying down, Lions S100 shibotwane pan and more general game at S100 road e.g. giraffe’s, impala’s, waterbuck, zebra’s, wildebeest, warthog and saddle-billed storks at the riverbed. More elephants at Orpen road on our way out. On the 21st Kruger, leopard lying down on the left side of the Orpen road before reception, elephants t-junction Ngala tented camp, buffalos before Rabelais road, rhino on the tar road, elephants on the first view point drinking. S100 mating lion pair and buffalos Sweni road. On the 24th before reception leopard under the small bridge come out lying down under small bushes next to the road. Rhino after Tamboti junction, elephants before Rabelais junction, zebra’s, giraffe’s also, lions with cubs T—junction H6 road Satara. Om the 26th elephants Orpen Gate, white Rhino and buffalos before Rabelais, leopard baobab tree road next to the river, rhino at Kumana dam, hippos back at the dam and more general game. On the 27th, elephants Orpen road before Rabelais road, S40 2km from the tar road 2 cheetahs ling down, lioness with cubs T-junction H6 riverbed, rhino after Nwanetsi bridge, Sweni road white Rhino grazing in an open area, buffalos and elephants Orpen road on our way out elephants, and buffalos before the last gate. Near Orpen we were very lucky most of the time we mainly found the big male leopard walking along that road stretching towards the reception – it is a very relaxed leopard that very often spent most of the time sleeping not concentrating on the volume of the cars or traffic. 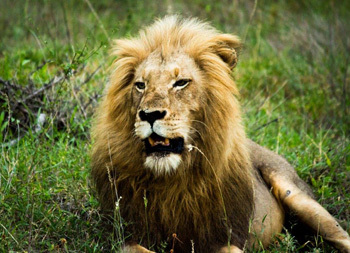 A breeding herd of Buffaloes that constantly roam around there attracts the pride of 16 lions. Satara always brings something good for my guests – a pride of 10 lions near Satara kept us very busy – spending almost 10 days in one place killing 4 Buffaloes at h6 junction, one buffalo was killed on the road. They killed the first two and spent 3 days feeding on it and killed the other two which again last them for another 3 days and hung around there as it looks like a killing zone . On S100 the pride of 17 lions is back again moving around ( one is a white lion ) This is a very well known pride called the Mega pride. Even as I am writing my report for the month I’ve just come from a beautiful sighting of the mega pride and making our way home four lionesses killed a zebra near Orpen. It was another warm month with very hot and humid days. Luckily we had a few days with good rain. The veld recovered a bit, with some nice green grass. 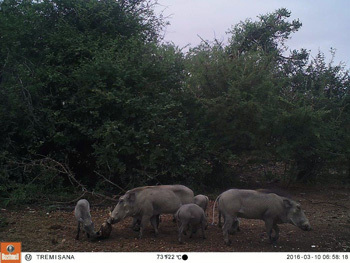 But we still have a lot of visitors at the water hole in front of the lodge: vervet monkeys, baboons, warthogs (3 females with in total 8 piglets) during the day. A Marabou stork is coming back on a regularly basis as well. A yellow-billed kite hangs around during the day as well. During the night we got sometime visits of porcupine, civet, jackal, genets, hyena’s, lions and elephants. We found a dead leopard tortoise and we put it near the waterhole with the camera trap. We were hoping for some predators to feed on it. But it turned out that the warthogs liked to play with it. They moved the empty shell around, in the water and out the water. It was fun to watch. Shoshangane, one of the big bull elephants, who was a regular visitor at our lodge passed away this month. He got injured in a fight with another bull elephant and died in the end of a heart attack. He will be missed. March was a very busy month with more than 400 guests. We’re looking forward to the next month! The rains were welcome. The Klaserie river is flowing better. We have been busy with renovations and have varnished most poles and bridges. We had 2 nyala deaths earlier in the month before the rains as there is so little to eat. Hopefully the rain will allow some grass to grow and we will not be so horribly disappointed in seeing dead animals. March has been a phenomenal month – we had the most amazing guests who appreciated the beauty of the lodge. All the guests were blown away by the tremendous décor of the wooden and rock theme style in our rooms. All the guests find our lapa area very unique compared to any other lodges around because it is open to the bush. One morning during breakfast, “walaaa” here come two blue wildebeest right in front of our lapa area, they really enjoyed watching them and they also had nice pictures. 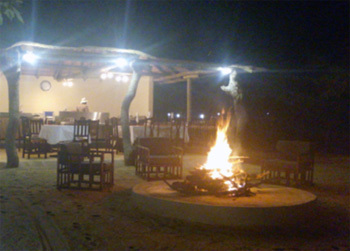 At night our guests really enjoyed the beautiful big flames of fire around our little boma area while enjoying their drinks and the beauty of the sky, while listening to calls of hyenas and lions. Wow experience !! Big flames of fire around our little comfy boma. We wish our new management couple, Elena and Allan, all the best as they assume duties on 1 April 2016. Thanks to Tsakane ( TK ) for running the lodge up to the end of March – you did a great job ! We have employed VICTOR who I have known for a very long time. Victor was previously employed at Orpen Gate and, amongst other duties, he ran the coffee kiosk. Victor is completing his FGASA ranger training course. His smiling face, eagerness to please and willingness to help in any way will endear him both to the Katekani staff and also to all our guests. It has been a record March – thank you for your fantastic support ! We have bought 2 more open sided vehicles for use in Kruger Park. Unlike all the others, these are diesel and we hope to save some money with the usual petrol increases – I am reliably told that diesel will be cheaper than petrol for the foreseeable future. We plan to upgrade chalets 1 to 4 at Tremisana Lodge. This is as a result of the big increase in luxury lodge clients. The guests will spend their first night at Tremisana Lodge. We have a lot of copies of our new A 4 colour brochure. Please let me know if you would like some. We stayed one night at Tremisana and 2 nights at Marc’s Treehouse Camp, and had a wonderful experience at both places. The staff were friendly and welcoming, as well as very organised. Pretty and her team fed us generously with their delicious home-cooked food, served in a beautiful setting. The game drive at dusk and our Braai under the stars were really something special, as was the early morning walk in the bush with our excellent guide Bongani (and the wonderful Tanya!) Our room was basic but spotlessly clean with a comfortable bed, and the swimming pool was perfect after a hot day on the truck! All in all they gave us an experience we will never forget. A lovely rustic camp in the bush, nyalas grasing around, birds singing, little monkeys trying to steal your bread, fish in the pond at the lapa (the place for breakfast), the lion roaring at night, the river rushing by, an enchanted place for those who like it a bit wilder. Most enchanting were the people: TK and Margaret and the good humored rangers: Philip and Patrick. Loads of thanks to everybody! !